This could have been done a long time ago, but other things get in the way. You know how life is. 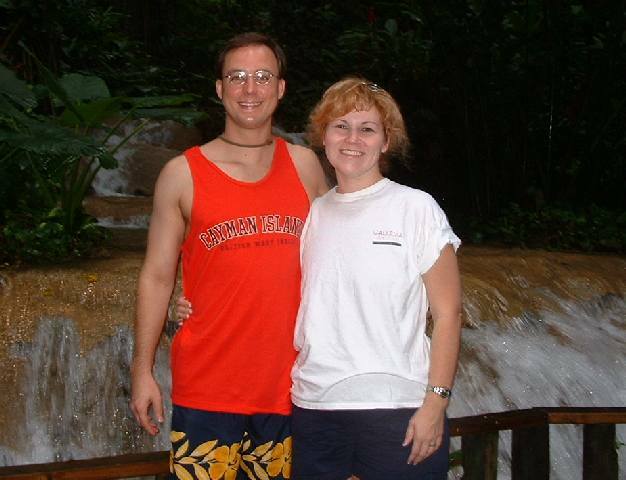 Our honeymoon was a week-long cruise leaving from Miami, Florida, and traveling to ports in the Cayman Islands and Jamaica. 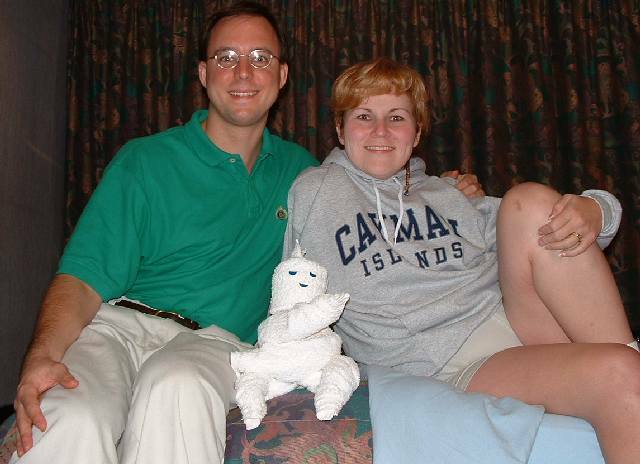 We suspect that Alexander was conceived at some point during the trip. 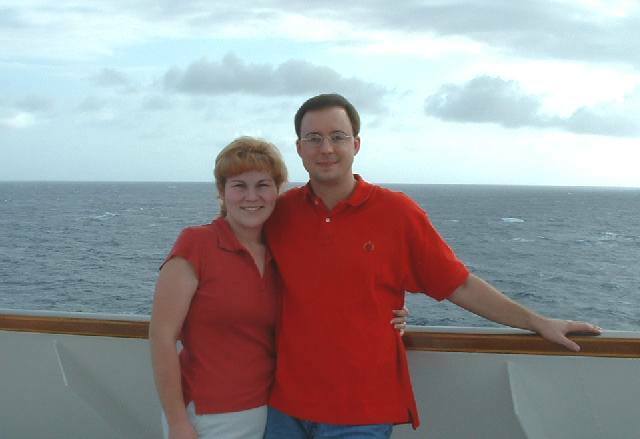 One of the nice fellow passengers took this picture of us posing on the bow of our ship, the Carnival Imagination. 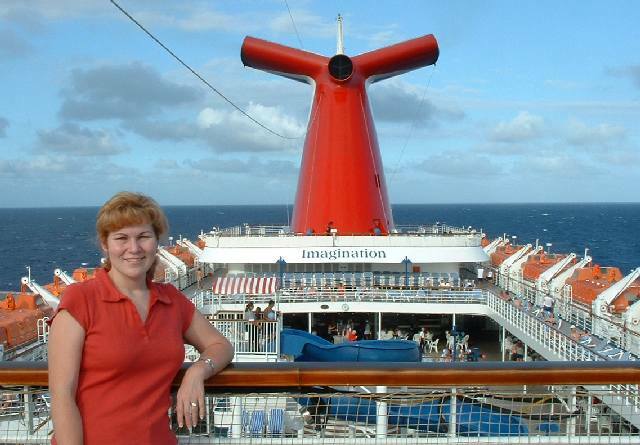 Here, Bunnie poses at the rail giving a good view of the ship's stern. Below the rail is the pool area. In the back is the distinctive Carnival funnel, which in profile looks like the tail of a giant airliner sticking out amidships. We dressed up for dinner with the captain on the second night. 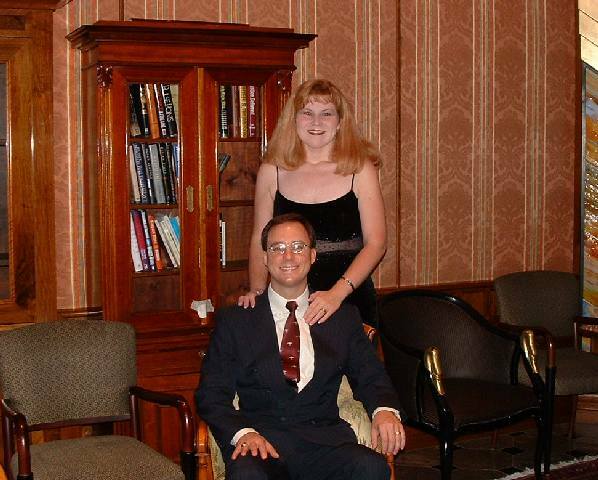 Someone was kind enough to snap this picture while we were in the ship's library. This may be a sunrise for all can recall... isn't it pretty? 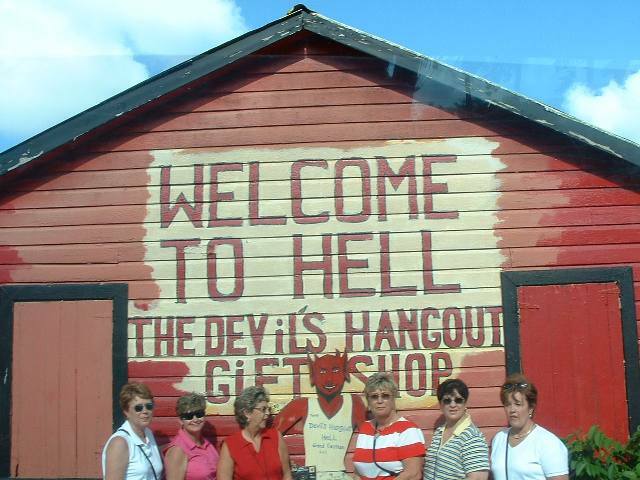 Hell is an unusual region of Grand Cayman with odd rock formations. It has its own post office so you can send the folks back home an official Post Card From Hell. 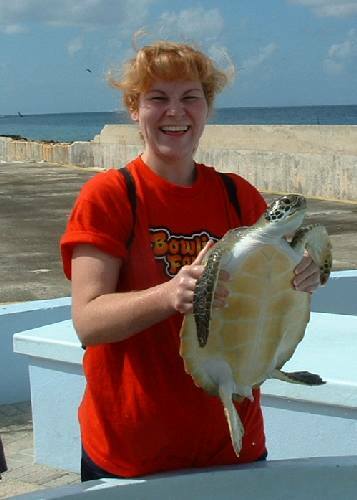 Bunnie and I had a good time playing with, picking up, and photographing the sea turtles at the Cayman Turtle Farm. Unlike more purely ecological enterprises, a good portion of the turtles raised at the farm are eaten rather than released into the wild. 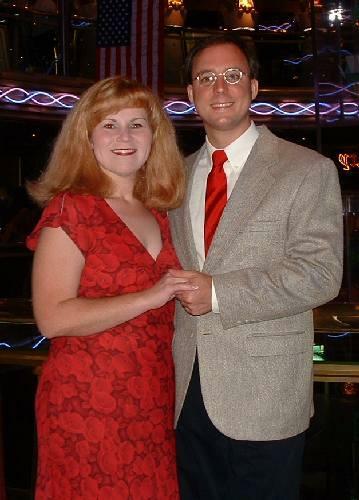 Our third night at sea we dressed up for dinner. The first night was casual (not everybody had their luggage yet), and the second night was semi-formal. This was kinda in-between. 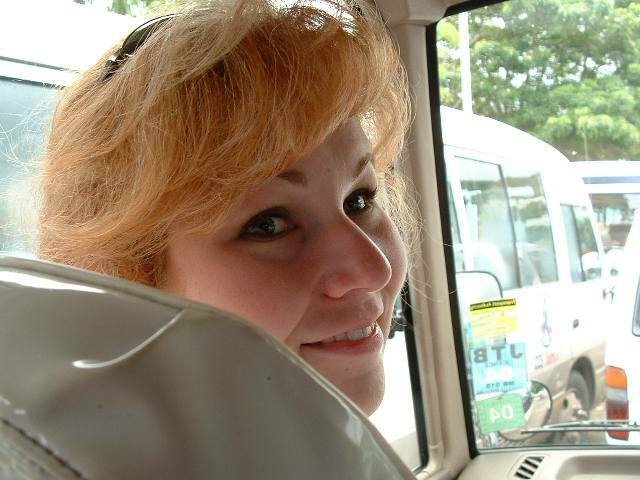 Kellie and I took a tour bus in Ocho Rios, Jamaica, to our destinations. This was one of my favourite pictures, despite our not really doing anything at the time. 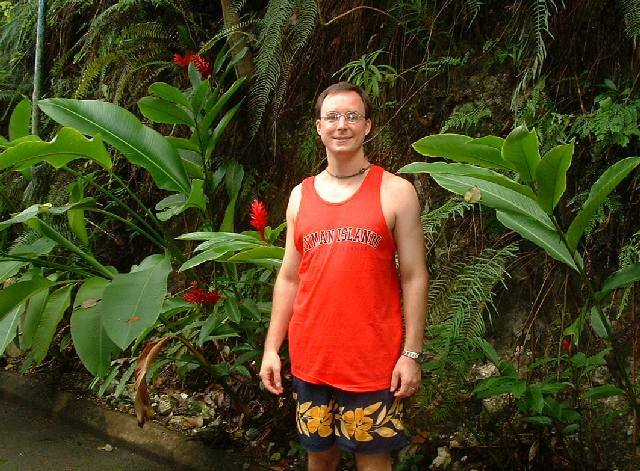 Here I am in the garden on Jamaica. What was obviously once the grounds of a posh resort is now a minor tourist attraction. Still, it's like your own little slice of rainforest, and you can take comfort in knowing you probably couldn't have afforded to set foot on the property when it was still operational. The majority of the waterfalls in the garden were man-made. That does not diminish their being refreshing when you step under them, however. Part ofthe fun of the garden tour was the bird enclosure. 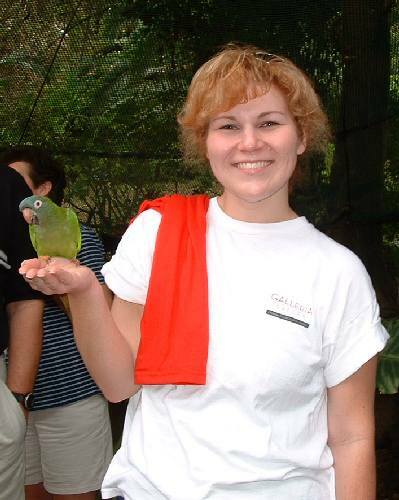 We guests were allowed a few minutes and a handful of feed to enjoy the presence of some well-behaved exotic birds. The safest part of Ocho Rios is without a doubt Jimmy Buffet's Margaritaville. The enclosure consists of a several specialty shops (including the aforementioned bar) enclosed in a gigantic wooden palisade and surrounded by armed and armoured guards. 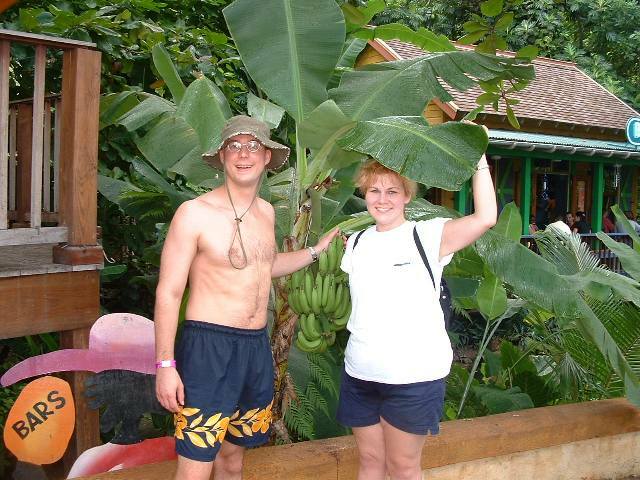 Here, we enjoyed a brief street-urchin-free respite in the presence of real honest-to-goodness banana tree. Kellie got her first taste of the ocean when we jumped off the back of a fishing boat in Stingray City. 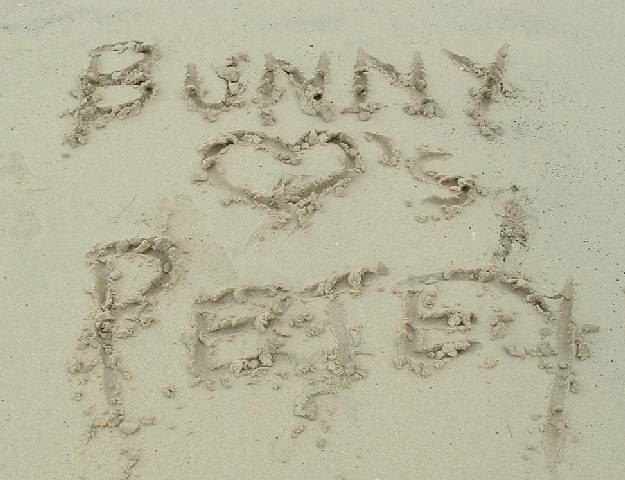 We spent a little more time on the private beach at Margaritaville, where she etched a fleeting declaration of our love into the wet sand. 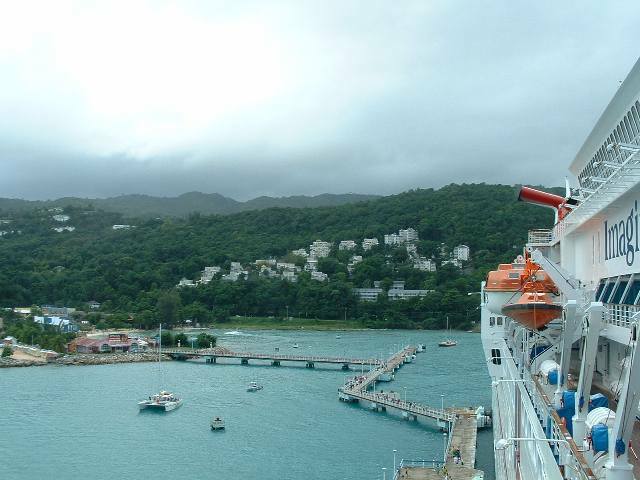 Once we go back to the ship, I snapped this picture of Ocho Rios. 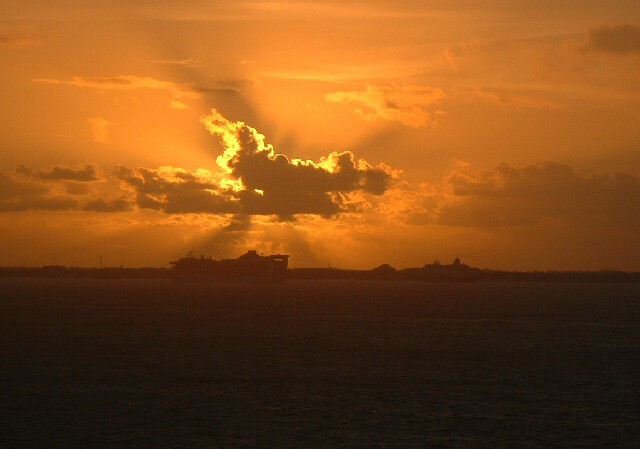 The clouds move rapidly over the island, resulting in frequently interchanging periods of clear blue skies and cooling "liquid sunshine" as shown in this picture. Carnival trains its stewards to fold "Towel Pals." Once we returned to the ship, we decided to pose with our particular pal from that evening.